Not only is this the first animated Korean film to be reviewed on EonTalk, but I believe it’s the first Korean animated movie I’ve ever seen; or if I had seen any others, I can’t recall of any. Which probably indicates that if I had watched one, it wasn’t very good. 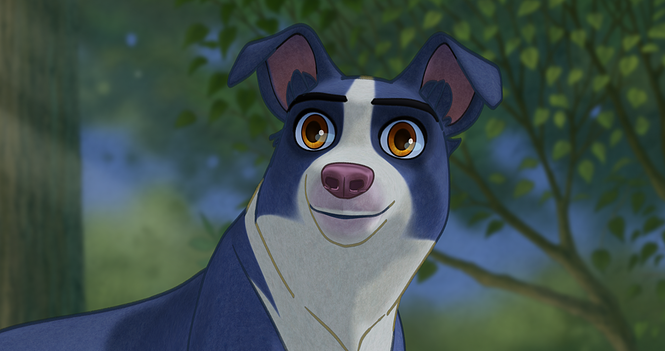 Although I initially wasn’t very interested in <Underdog>, after learning of the incredible lineup of voice actors and the fact that it was rewarded the 2018 Silk road Film Festival’s “Best Animation” Award, my stance quickly changed. With double directors of Oh Sung-Yoon and Lee Choon-Baek, <Underdog> is a Korean animated feature film about, you guessed it, dogs. 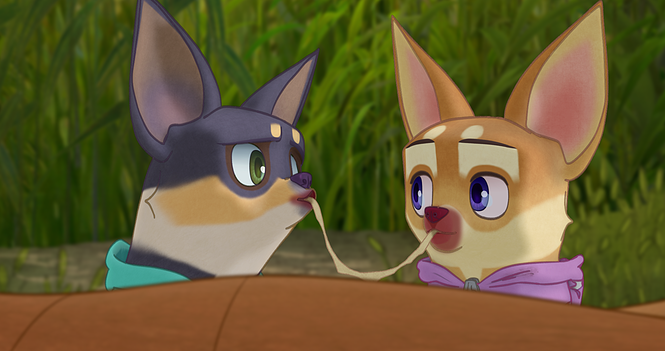 More specifically, the story revolves around a group of dogs that were abandoned by their owners, and must survive on their own in the wild. The main cast consists of D.O. of EXO, Park So-Dam, and Park Chul-Min playing the voices of the main characters. “Moong-Chi” (D.O) lived a happy life with his owners ever since he was brought home when he was just a puppy. However, that all changes and his life is flipped upside down. Going on what he thought was another car ride, Moong-Chi is left stranded in the middle of a forest when his owner abandons him. Unable to accept reality at first, Moong-Chi denies that his owner deserted him. Once he meets “Jjanga” (Park Chul-Min) and his pack, a group of dogs that were also abandoned by their owners, they are able to get him to realize the truth, and their story of survival begins. As they start to become accustomed to the street life, their new home becomes on the brink of destruction. An adventure in pursuit of a new doggy life begins! I personally love animations. Although I hadn’t seen any Korean animated films prior to this, I absolutely adore Pixar films. The ‘Toy Story’ franchise is my personal favorite, and although the animation in <Underdog> is very different from the likes of Pixar or the recent <Spider-Man: Into the Spider-Verse>, it definitely has its own appeal. Unlike Pixar, the animation was not 3D animated, but was 2D; it was as if a fairy-tale book came to life on the big screen. It did feel sort of laggy and not smooth at times, but that’s part of what gives it its distinctive design. I especially liked how Moong-Chi’s eyes were different in style from the rest of the animation. The shiny eyes gave the 2D-design of the character life and personified emotions. In Korea, there’s a strong perception around animated films that its intended for children. I’m sure this may be true in other parts of the world as well, but I recall Pixar films being regarded as for all ages in the States. However, even Pixar movies are seen as “for children” by many in Korea. At least that’s how it was before. I was very surprised to see that the theater of the screening I attended had lots of adults. It’s great to see that animated features are getting the appreciation and love it deserves, especially for those that have a great story. And speaking of great story, the narrative is the biggest component of an animation’s quality, in my opinion. It’s what separates it from being merely a “cartoon” and a remarkable work of art. Take for example Pixar films; yes the computer-generated animations are phenomenal. But it’s the insightful story that possesses a deeper layer of meaning that makes it a masterpiece. That being said, I highly appreciated that <Underdog> didn’t only strive to satisfy kids with juvenile, cheesy jokes, but also had a deeper purpose behind it. The film goes over the importance of not only friends and family, but animal cruelty. It has a social message that it stands behind. Dog farming is a huge issue in Korea, and it directly tackles this problem head-on. Okay, frankly speaking there were some cheesiness to the movie. But hey, can you blame it? A certain level of cringe is expected in animated films, especially since the main target of animations tends to be younger generations. There were a few scenes that did slightly make me squirm in my seat, but nothing that undermines the film for its greatness. Also, I feel like cheesiness is only acceptable and possible because it’s an animated film. You don’t go into Disney animated movies and claim it’s bad because it has some cheesiness to it, do you? (Think of <Frozen>). And as I mentioned in the first part of the “Good” part, although I appreciated the type of 2D animation <Underdog> had, I can see why some may claim they don’t like it. It’s different. It’s old-school and not seen commonly anymore. It reminded me of the older Disney films like <Lion King>, <101 Dalmatians>, etc. In a time and age where 3D animation is the standard, it’s good to go back to the older styles once in a while. If you love animated movies, I highly recommend you see this Korean animation feature. No, it doesn’t have the fancy computer-generated animation that you see in other animation films, but the story is amazing and you’ll appreciate the adventure it takes you on. 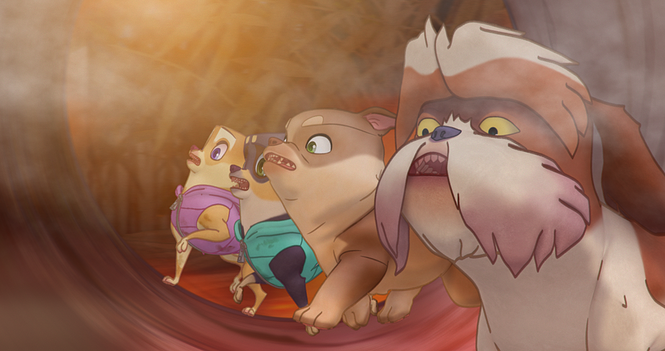 <Underdog> is great for all ages, and will make you laugh and feel emotional, all at the same time.